The heat of the summer is upon us. For those that enjoy the cool breeze of their air conditioning, that means massive power bills are upon us as well. If on there was a way to preserve the sweet coolness that we are robbed of by outdoor heat. Alas! You can prevent loss of cool air in your house with the use of cellular shades. These shades are ingeniously designed to trap changing temperature within cell blocks built into the blinds. Think of them as sort of a booby trap for unwanted temperatures. Heat on the outside cannot get in and cold air on the inside cannot get out. This greatly improves the efficiency of your air conditioning unit and can even drastically improve your light bill by preserving cool air. However, the benefits of owning cellular shades doesn’t stop there. 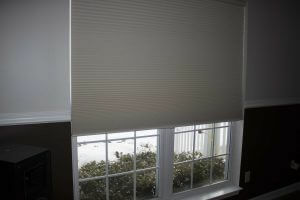 Once summer is out the door, the cold winter creeps in, but don’t worry cellular shades work against the cold as well. Jumping back to what we said before, cellular shades are a blockade between two differing temperatures. So regardless of what side the cold air is on (inside, or outside) it will not pass through. This means your heater will only need to run half the time, because once the hot air is created it will be trapped inside your house for longer periods of time. Another great benefit is an optimum level of privacy. The fibrous make-up of the shades completely blocks out unwanted lurkers, or bothersome neighbors. As a bonus, given their lightweight design, they still let in enough light to gracefully accent a room. With the constantly record breaking temperatures every summer, one should heavily consider investing in cellular shades. They are a well warranted luxury that will spare your wallet in the long run. Make sure to get your money’s worth and have these shades installed by a professional. Once installed these shades are sturdy, and with certain packages, childproof. Call Made4uShades (828-835-4957) for a prompt and courteous quote free of charge. Most importantly of all, be sure to stay cool this summer.